In the past organizational excellence was defined by effectively managing people and tasks. But this overlooks an important dimension in today’s environment: how to effectively manage data, information, and knowledge to produce appropriate actions. 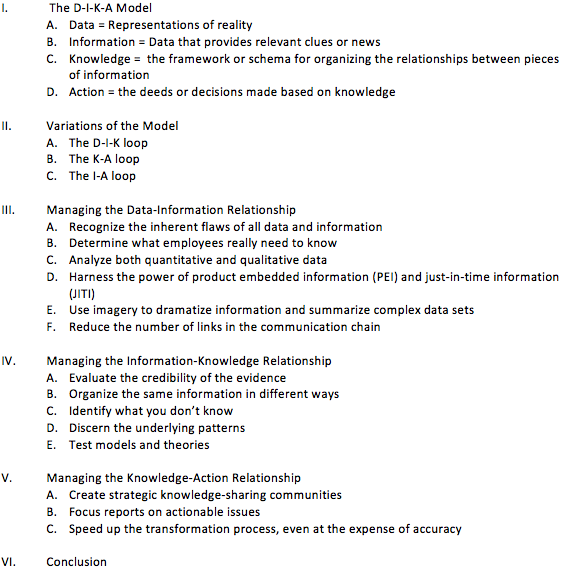 The chapter presents a model for the ideal management of data, information, knowledge and action. Most organizations, though, experience a variation of the model, such as the D-I-K loop where there’s a lot of activity but no action. On the other hand, managers often create an I-A loop where they get caught up in the “program of the month” cycle. Several ways in which the data-information relationship can be enhanced include reducing the number of links in the communication chain and using imagery to dramatize information. The information-knowledge relationship can be enhanced by organizing the same information in different ways and evaluating the credibility of the evidence. The knowledge-action relationship can be strengthened by creating strategic knowledge-sharing communities and focusing reports on actionable issues. The purpose of this case is to design the strategy and tactics to help an insurance company manage information and knowledge. We have fax, e-mail, computer conferences, voice mail, employee publications, quarterly meetings, and just about any other media you can think of…but we still can’t seem to get our message across. Employees tend to hoard information. They share it, but only when asked. We generate reams of data and yet it rarely informs our decision-making. There is so much information out there in so many forms (much of which is redundant) that I’m confused half the time. We need to learn from each other but we don’t. What we need is a strategy that will coordinate all this information, the people and the communication media. We need to get people talking about the things that solve our real problems, add value to service and improve productivity! Develop the tactics necessary to implement the strategy. Provide an evaluation mechanism for the process. What particular fact had the most impact on you? Why? What underlying organizational problems does the clip expose? Was information overload a problem in the 1700’s? 1800’s? 1900’s? What did you learn about knowledge management by watching this clip? How does knowledge management differ from information management? What are some examples? What attribute of knowledge is the hardest to manage? Why? Identify a functional and dysfunctional knowledge sharing community. What are the key features that distinguish the two? Find a website that meets all the tests of evidence. Find another one that fails most of the tests. Provide specific examples. What errors did the previous task force make in interpreting the survey results? Will the task force featured in this video clip do a better job than the former team? If so, why?